All of our children in the Nursery room have their own individual cot across three cot rooms. This allows the children to feel safe and secure with a sense of belonging. Each child’s individual sleep pattern is followed based on our intimate knowledge of the children’s routines. Through primary caring the children are able to have soothing and calming rest and sleep times. Sleeping children are checked on by Educators in 15 minute intervals. Sheets are supplied in the Nursery room and families are asked to provide bedding appropriate for the weather and in accordance with the SIDS and Kids recommendations for safe sleeping. Sleeping bags are often used for the children in the Nursery as it helps to provide an extra sense of security and comfort. 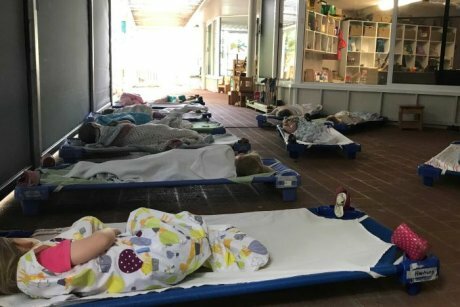 At Woden Early Childhood Centre the children from the Toddler Room, Intro Room and the Pre-School Room all sleep outside under our beautiful verandah, we have been doing this since late 2014. We have sun blinds that shelter the space from the hot sun and winds. Soft music fills the air as children rest or drift off to sleep. The Toddler and Intro children sleep or rest on stretcher beds, while the Pre-School children sleep or rest on mats. The Centre supplies sheets and families are asked to provide bedding appropriate to the weather. Educators are mindful of the weather and will sometimes provide rest and sleep times indoors if it is too wet, too hot or extremely cold. The educators have found that the children sleep better and wake more refreshed in the outdoor environment. Anecdotally we have seen better health in those children sleeping or resting outdoors. This has in turn reduced the amount of time away from the Centre. The children get up from their rest or sleep and are able to play in their room, leaving the verandah a quite peaceful place for those who sleep longer. There are several articles about the benefits of sleeping in the outdoors here are two you may be interested in. Check out this article from ABC News about outdoor sleeping at our service!